People hold their most important ceremonies near water. In the Afro-Cuban spiritual religion of Santaria, the Orisha goddess of the sea is Yemaya. She is the mother of all living things and is honored with offerings of fruit and treasures thrown into the sea. Nowadays, offerings to Yemaya are wrapped in plastic then thrown into the ocean. We all cringed as we watched this young man throw his plastic bag into the ocean. We had just cleaned this beach and knew that by tomorrow, this bag would be washed ashore. There is still a lot of work to be done in Cuba to educate this island about plastic waste before US tourism makes our mark. A salty pineapple offered up to Yemaya. A message in a plastic bottle with secrets for Yemaya, the ocean goddess of Santaria. Our brains instinctually know that there is an innate connection between water and life. Spending time in, on, under, and near the water makes us calmer, happier, healthier, more connected, and better at what we do. Physiologically, our brains and bodies change near water. It is no coincidence that some of our best ideas and breakthroughs come to us when we are in the shower. Sustained focus makes our brains burn out and shut down causing us to get "stuck". Hearing the sound of water and feeling the soothing effects of water shower over our head triggers our brains to go into "drift mode". In this mode, our brain is using less energy and working smarter rather than harder. We slip into a completely different quality of thought that is much more introspective and present. It is in this flow state when we feel a deep sense of connectedness that leads to "aha" moments. Water access has been shown to reduce the effects of Post-Traumatic Stress Disorder, depression, anxiety, and grief. Water play helps improve fitness, focus, and calm through a re-centering of the self. The ocean, therefore, is an important therapeutic tool for strengthening our mental wellbeing, emotional diversity, and resiliency. Yet, funny thing is, we don't support activities that promote a healthy relationship with the ocean. We highly undervalue the oceans. This is why we are working to instill a "Blue Mind" in Cuba through our non-profit work with The Wahine Project Cuba. We are 97 miles from Cuba. With a shared ocean, we believe it is important for Cuba's youth to develop a relationship with the ocean. The Wahine Project Cuba fosters ocean stewardship among women and girls by providing positive, transformative experiences in, on, under, and near the ocean. Behind Pay sit Danito and Yaya, two of the main reasons The Wahine Project Cuba has taken shape. Frank, on the right, has been surfing Cuba's coasts longer than anyone. He is a true waterman, an excellent host, and now proud papa to a 6-month old named, Paola (the same name as me!). Frank is also a talented dolphin trainer at the Aquarium. The underwater show that his wife, Yenia, choreographed is not to be missed! It takes place in front of a massive window looking into an entirely blue dining room. The blue glow from the exhibit eases you into an blue state of mind. 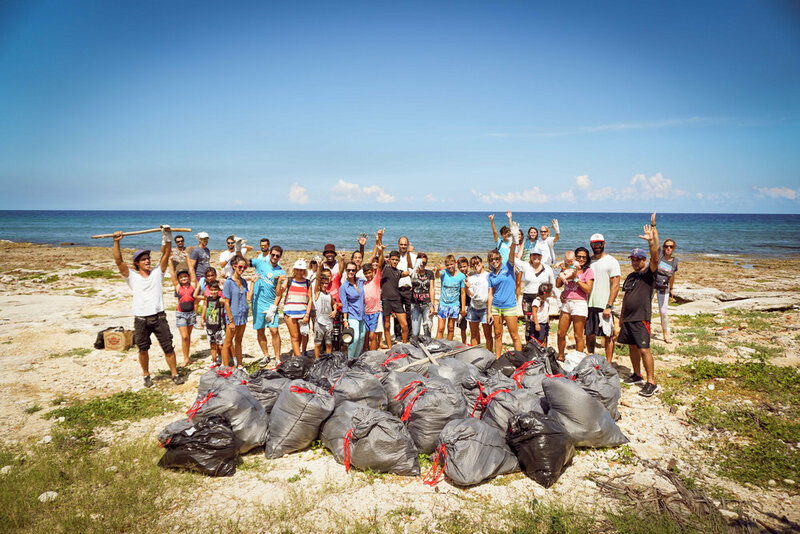 As part of the International Coastal Cleanup Day, we collected over 50 bags of trash from the beach at "La 70" - a popular surf break near the National Aquarium of Cuba. Our most excellent ride to Playa Megano - a sandy beach with beginner-friendly waves 45 minutes outside of Havana. Transportation to these beaches is a big challenge for our Wahines because taxis can be expensive and bus drivers will not allow the oversized boards on their overcrowded buses. Thanks to a private donor, 10 Wahines and surfboards made it to the beach! This mother of 2 Wahines had never been on a surfboard before this photograph was taken. She lives directly in front of the beach, but rarely joined her children in the ocean. All of that changed this day. Isis Salcines is the daughter of the man who owns the Alamar organic farm on the outskirts of Havana. She now runs and represents the farm locally and internationally. Her mission is to inspire young people to try new flavors, appreciate hand grown food, and return to the Earth. Yenia, Frank, and Paola - the new Blue Minded Family. Every morning began with tuna sandwiches and cafecitos. This magical backyard made everything taste better and last longer. When you want to eat on the go in Cuba, your choices will almost always be either some variation of a ham and cheese sandwich, a hamburger, or pizza. This particular pizza Napolitano from Giselles Pizza near the National Hotel was not only incredibly hot and tasty, it was also the least expensive we found. Just as we made it out of the tourist trap that is Callejon de Hamel, an alley with painted walls and amusing sculpture, we managed to stumble across this corner bar just a few yards away. Here, we had the coldest, cheapest beer sold on the island - or so we were convinced. To really cover a story, you have to live that story. Vivian and Ismario, two local journalists who joined us for a Wahine clinic to cover our efforts for OnCuba Magazine may have gotten a little salty but at the end of the day, really understood our message that salt heals. This is 4-year-old Isa. Born a fish, she loves to be immersed in the ocean. This is what a "Blue Minded" future looks like. Once a lively rooftop hotel restaurant in the 1950s, a group of 30-something year-old friends are working to bring this view back to life with a new energy. Long days working on your dream are worth it. 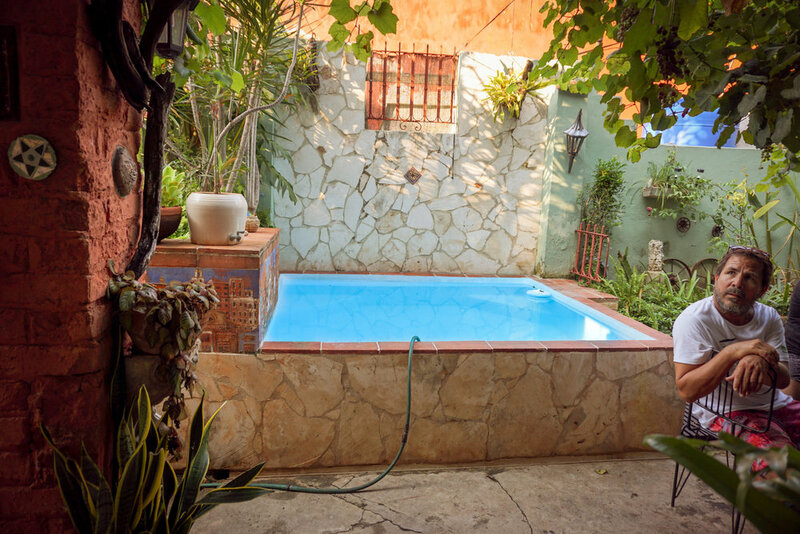 Being by water invites creative energy so it's not so surprising that every day ended in or near this soaking pool at Frank's house. Environmental activist, marine biologist, and Wahine Project Cuba supporter, Anglea Corvea (middle), is full of life, hope, and positive energy. She created "Acualina" to inspire Cuba's youth to become ocean stewards. Angela and I "adopted" each other this trip which means the Blue Mind circle just expanded ten-fold! The house we stayed in belongs to Frank's mother. She is an amazing artist who now lives in Miami. Her funky touch can be seen everywhere in the house. To create memories for when she returns, she encourages everyone who stays in the house to leave their mark. Pay and I left a mural that we unveiled during our final family dinner the last night of our stay. I think "Vikki" the California Sea Lion had a crush on Pay - must have been the whiskers! As we drove from Havana to Santa Clara where we would be flying back to Ft. Lauderdale the next morning, the warm rays of the lasting sunset bathed over us as if to extend the warm welcome we felt on day 1. To continue the momentum, we plan on traveling back to Cuba the first week of December. 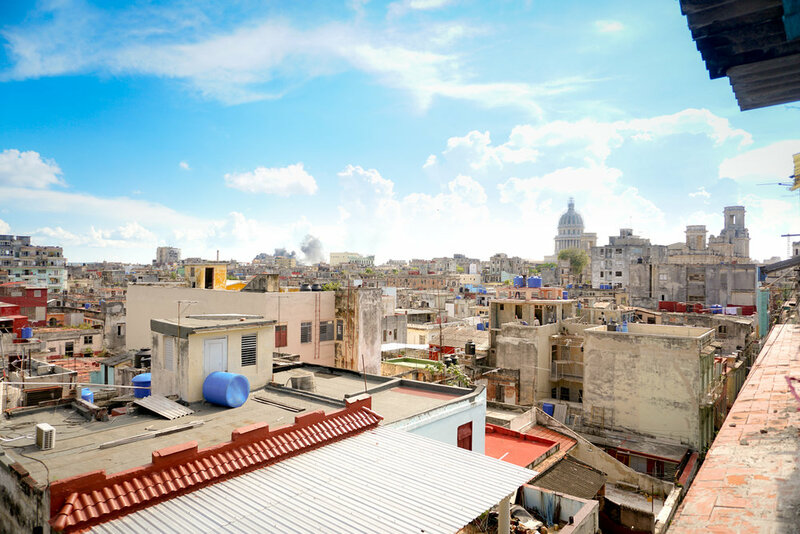 We will be extending the Wahine program to Santa Fe, a community on the outskirts of Havana. In between surf and beach clinics, we will be taking the Wahines to visit Organoponico Vivero Alamar to learn about the connection between organic farming and healthy coral reefs. We hope to also give workshops and provide waterproof cameras for the Wahines to document their "Blue" vision for a future exhibition at the progressive, Fabrica de Arte gallery in Havana, Cuba.